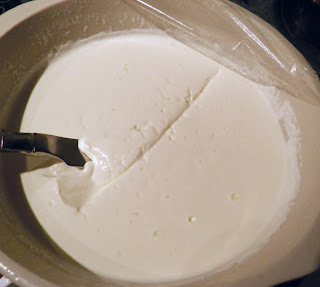 Creamy, smooth, sweet and wonderful – homemade mascarpone cheese. Mascarpone, mascarpone, mascarpone… I have to repeat it because I’m one of the many people who used to pronounce and spell it incorrectly. This is the cheese after sitting the first night in the refrigerator. “Marscapone” is the pronunciation equivalent of “nuc-u-lur.” It’s nuclear, and nothing else. And it is mascarpone. One can be forgiven as many TV chefs pronounce it with the R in the wrong place too. Mispronunciation of someone’s name is always insulting. Mispronouncing a food’s name lies more on the side of potential ignorance – one might assume. So from now on at least I will be correct. I purchased a cheese making magazine a few months ago and was surprised to see a recipe for mascarpone. It looked so easy. And it is! 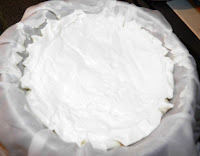 Mascarpone is an Italian cheese made from cream coagulated by using tartaric acid, citric acid, or lemon juice. After the coagulation the whey is allowed to drain out naturally. This means, because of all the sitting, it isn’t a cheese you can just whip up like ricotta which is ready in less that an hour. You have to plan for when you need it. additional 24 hours to remove excess whey. Aside from the 48 hours for the whole process, this cheese is a breeze. I made much more than I needed (word to the wise) unless I plan on making a big tiramisu. The quantities listed are for the larger amount, but feel free to halve it. The result will be the same. Go big or go home, I say. Mascarpone makes the cholesterol police go on red alert. I always remember Julia Child’s admonition: “Everything in moderation, including moderation.” I love that she said that. She was right of course. A steady diet of too much of anything will kill you, probably even broccoli. 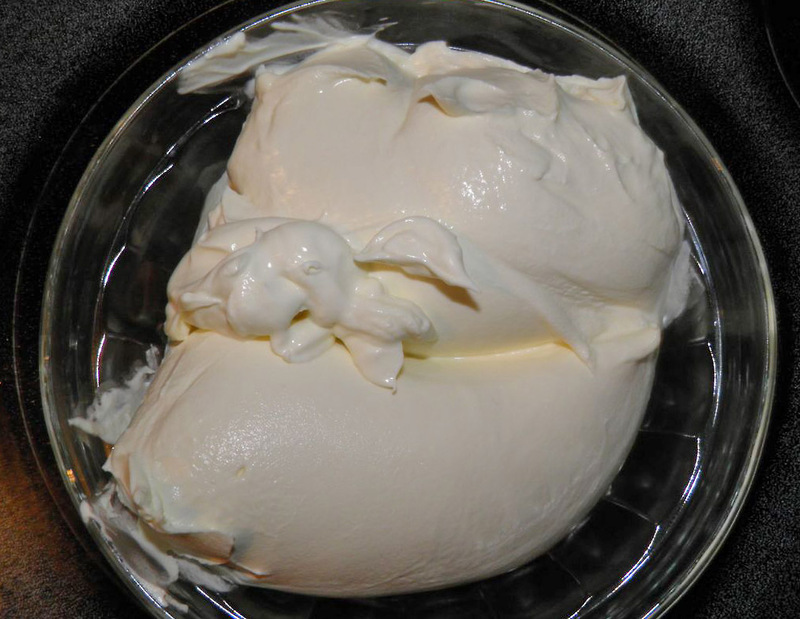 Mascarpone is the colour of cream and is thick like a spread. It has many uses besides in tiramisu. It can be served in savoury dishes or with fresh fruit. It’s also used as a substitute for butter or parmesan in risotto. Mascarpone originated in the Lombardy region of Italy in the late 1500s. It is uncertain where the name originated but it is possibly from a related milk product called mascarpa. Does it really matter? The important fact is that it is wonderfully delicious and addictive and if you want to make tiramisu you have to have it. But just like everything else in life, don’t overdo it. An important note about this recipe is cost. To purchase this amount of mascarpone costs $12.99 CAN. To make it costs about half that amount. throw the whey out. It has a million excellent uses. 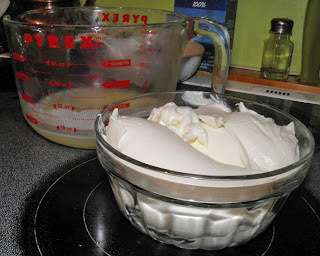 The starting cream mixture needs to be around 25% butter fat. To do so use two different creams. The ingredients above make a combination of 27%. Close enough. 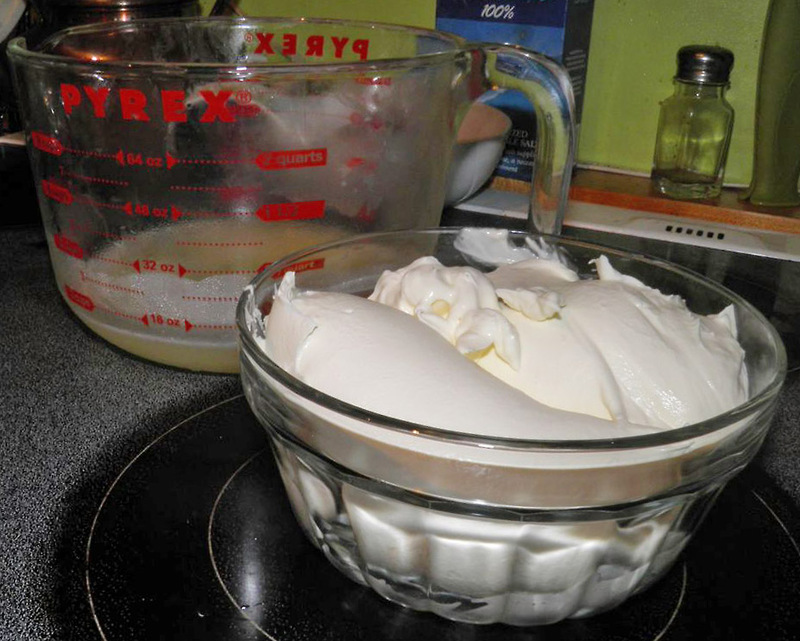 Combine the cream in the top part of a double boiler. I do not own a double boiler so I inserted a smaller pot inside another pot partly filled with water. It works just fine. Once the cream reaches temperature, reduce the heat to hold it at 185°F and stir in the lemon juice. Mix well. Cover the pot, hold the temperature and let cook for 5 minutes. Remove the pot from the double boiler. You will notice that the cream has thickened slightly. It will thicken more as it cools. Place the cream in the refrigerator for 24 hours. After 24 hours you will see the cream has thickened more (second photo at top). 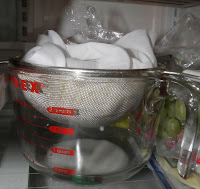 Strain the cream/cheese over a bowl through fine cloth lining a sieve to remove the excess moisture. Let it sit back in the refrigerator for another 24 hours to do so. 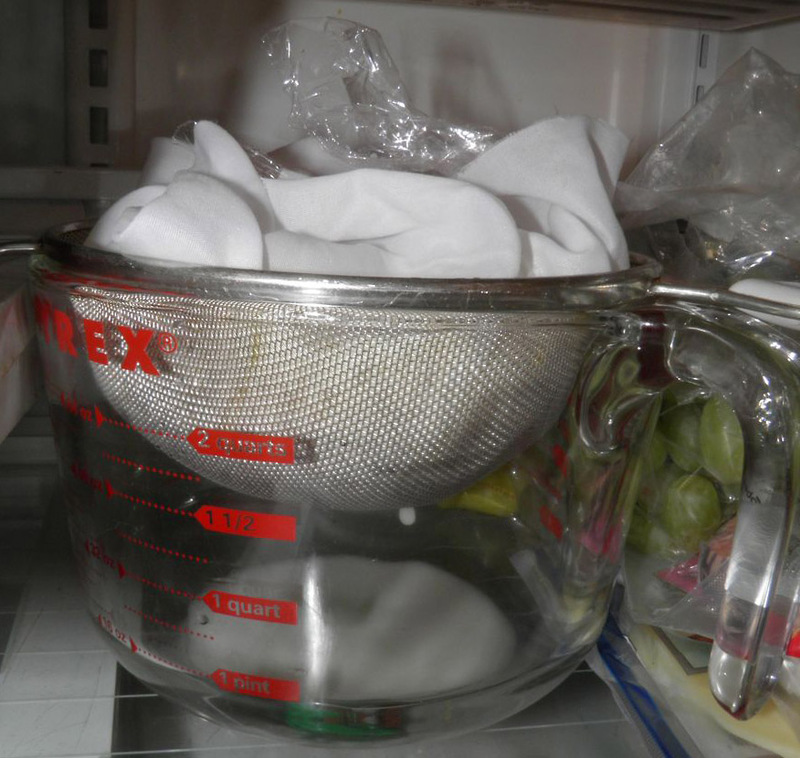 After 24 hours remove the cheese from the cloth and place in a storage container. The cheese will last refrigerated for about one week.